The Mansions of Avondale stands out as one of the best in the area. As they strive to be the best they can be for their residents, their focus is on two goals. One is what they describe as The WOW Factor and the other is to encourage a sense of community. The WOW Factor is simple although, at times, they describe it as nothing more than “keeping up with the times.” What this means is that every aspect of The Mansions of Avondale should be the best it can be. They want The Mansions to look its best not only for residents but also visitors and prospective buyers. The building is immaculate. There is no visible damage to walls or floors and windows are spotless. What stands out most, however, is the cleanliness of all areas and absence of trash in elevators, hallways or other public areas. Despite being just over ten years old, The Mansions is preparing for a major facelift. They are currently undergoing structural repairs and ready to commence an indoor restoration of carpets, walls and fixtures. Many condos do not undertake such an initiative more than once every 15 or 20 years. The Exercise Area has equipment comparable in quality to a private gym. This includes cardio equipment, free weights and strength building machines. Whereas many condos feel it is sufficient to have an Exercise Room, The Mansions provides top of the line equipment that is replaced long before it can rust or be permanently damaged due to age or excessive use. This higher quality equipment makes the room more appealing to those who are more active and likely to use the room on a regular basis. Their circular swimming pool and Jacuzzi are equally impressive along with sauna, showers and locker room. All areas are modern, clean and well maintained. As with other areas of the building there are no worn carpets, damaged walls or other visible damage requiring repair. The Party Room is complete with a 60″ TV, lounge chairs, full kitchen and dining area. Encouraging a sense of community is extremely difficult. Many condo boards talk about this but few are successful. The Mansions is a young and diverse community. A majority of residents are 29-45 years old. This resident mix includes singles, married, seniors and families. A substantial number of units include school age children. Some condos have rules to discourage pets. Others avoid recognition of the needs of families. Often these approaches are cited to reduce cost, avoid damage or ensure quiet. The Mansions takes the opposite approach. They are family and pet friendly. The swimming pool is a popular after school activity for many of the younger residents. There are no pet restrictions and residents currently have pets in excess of 100 lbs. Social programs include one for new mothers and summer BBQs. BBQ events are held in a courtyard with three separate BBQs and abundant seating. One BBQ is available year round for winter BBQ events. The area overlooks a local park. The Internet is integral to The Mansions’ communications with residents. They recognize that the Internet has become the preferred form of communication for people of all ages. It also has clear advantages in fostering a sense of community by making more people aware of more information that is pertinent to each of them. To achieve their goal of 100% connectivity among residents their website, complete with online registration, allows for booking of rooms, communications between residents and management, and sharing of information. It is an online location for the community to congregate, plan, organize and communicate. At The Mansions people want to know their neighbours, say hello to each other and socialize. With this in mind, they plan to expand on community BBQs and other events that bring residents out of their units to socialize. Some may look at The Mansions as a wealthy community that can afford to do all this. The reality is that The Mansions is able to provide a superior lifestyle for all through effective planning, considering their entire community and paying attention to detail while maintaining monthly common expense fees at an average level. 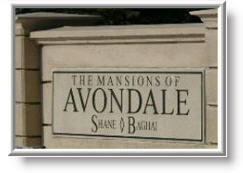 The Mansions is part of the larger Avondale community that includes parks, townhomes and a playground. It is, in short, a community that works.